Your tour begins in Golden Gate Park to experience the Golden Gate Bridge. The Golden Gate Bridge opened in 1937, and quickly became known as The San Francisco landmark. The bridge spans 1.7 miles reaching hundreds of feet above water ($49 toll + parking). Being that it is one of this country’s most famous landmarks, one must simply experience it in all its glory. When walking, start off at the aptly named Roundhouse located on the east side of the bridge. The historic Roundhouse was designed in 1938 as a restaurant for motorists passing by. Now it houses the Golden Gate Bridge gift center. Before you head back to the other side of the bridge, take a long stroll underneath the bridge through the 5-acre gardens. Your group will then take a tour of Chinatown. During your guided walk through Chinatown you will forget that you&apos;re in San Francisco and may think that you&apos;re somewhere in China. You will see four blocks of unique shops and restaurants for dinner on your own, plus the famous Chinatown Fortune Cookie Factory. Down Grant Avenue from Columbus, we will walk through the scores of locals buying goods and services in the rather unique setting that sits amid the Financial District of San Francisco. Some of the best bakeries and local Chinese cuisine can be found all along Chinatown. Leave San Francisco for Oakhurst, CA (Madera County – California’s Gateway to Yosemite). Lunch stop at Hilmar Cheese Visitor Center Café to savor a delicious meal. Hilmar Cheese Company is where they annually produce more cheese and whey from one site (Hilmar, CA) than any other manufacturer in the world ($15-$27pp). Arrive in Oakhurst and head to Bass Lake, just a short drive, to enjoy the sights of this resort Lake in the Sierra National Forest. Walk around to The Pines Resort and explore the shops at The Pines Village—OR– drive to Gallery Row in Oakhurst to see the magnificent works of art from several artists who capture the local beauty, including Yosemite National Park, all in one location. Dine at the famous Ducey’s on the Lake at The Pines Resort located in Bass Lake, CA. Ducey’s is the signature restaurant at The Pines Resort and provides an upscale steakhouse setting that's perfect for families and special occasions. Enjoy delicious steaks, seafood and pastas, along with a diverse menu of flavorful dishes made with fresh, California-grown ingredients ($20-$50pp) or try their Sunset Dinner Menu with special pricing served 4-6pm. ($20-$30pp). Wawona’s Pioneer Village Center – travel back to the 19th century. The center is open year-round as a free self-guided tour. El Capitan is the largest single granite rock on earth where rock climbers from around the world converge to face the challenge of this massive monolith. Half Dome – at the far end of the valley is one of the world famous Half Dome. Have lunch in Yosemite National Park at the Yosemite Lodge Food Court. Open year-round for breakfast, lunch and dinner offering various stations serving hot breakfast, Italian pastas and pizza, grilled items, pre-made salads, fruits, vegetarian and non-vegetarian entrees, and of course desserts and our Coffee Corner ($10-$30pp). Yosemite Valley Visitor Center – learn how Yosemite’s spectacular landscape was formed, how people have interacted with it through the centuries, how wildlife adapts and survives, and how your national park continues to evolve at the exhibit hall. A free 23-minute film provides a stunning overview of Yosemite’s splendor. The Yosemite Museum, next to the Yosemite Valley Visitor Center, has displays that interpret the cultural history of Yosemite's native Miwok and Paiute people from 1850 to the present. There is also a reconstructed Indian Village of Ahwahnee behind the museum. The historic Yosemite Cemetery is located west of the Yosemite Museum. People buried here include people who played important roles in the development of what is now Yosemite National Park. Return to Oakhurst after sight-seeing in Yosemite Valley to dine at Crab Cakes. Enjoy dining in the nautically-themed restaurant and take in the beauty of the Sierra Nevada mountains. Crab Cakes specialize in fresh and shell fish and offer steak, chicken, pasta with full bar service from Roman's Bar featuring local micro-brewed beers and wines ($10-$40pp). Afterwards, take a short stroll from Crab Cakes to see, and hear, the World Famous Talking Bear in Oakhurst, also known as the Carved Bear Capital of the World. Leave Oakhurst and arrive in Cholame, CA for lunch at Jack Ranch Café ($18-$20pp). This historic location marks the spot of tragic traffic accident to where actor James Dean met his demise on September 30, 1955. A sculpture was commissioned and transported from Japan to the United States by visionary Seita Ohnishi. The tree is a specially planted tree of heaven or ailanthus. After lunch and a tour of the memorial, your group will head to Morro Bay, CA. 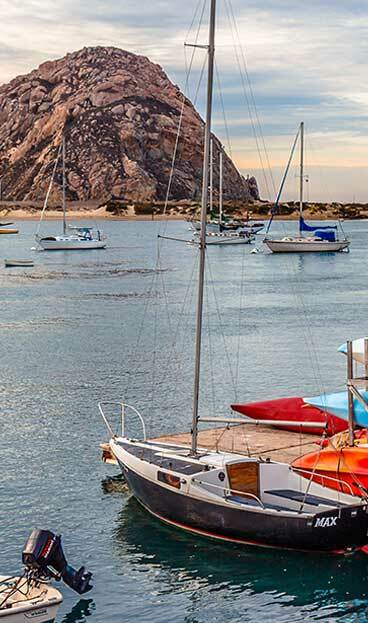 Arrive in Morro Bay for a salt water taffy welcome and meet the docent at the iconic Morro Rock, an idyllic backdrop for Morro Bay. Morro Rock is part of the Nine Sisters of extinct volcano peaks along the California coast. Home of nesting Peregrine Falcons and flanks both the bay as well as a beach. It serves as a natural attraction that attracts thousands of visitors each year. The docent will take you on a step-on guide adventure talking about the history of Morro Rock, the bay and the creatures who call the bay and national estuary home ($10-$15pp). Follow along the Embarcadero and learn about the commercial fishing industry (especially the Central Coast Women for Fisheries) and end up at the Museum of Natural History for a self-guided tour ($3pp). After freshening up at the hotel in Morro Bay, your group will board Chablis Cruises for a two-hour dinner cruise ($38-$42pp). Your groups will be amazed with the beauty of the water and the bay while dining on a delicious menu of scrumptious delights. Board the bus for a scenic drive up Highway 1 of California’s beautiful coast to Hearst Castle. Discover this legendary estate’s history, and learn more about its twenty five thousand artifacts. Hearst and architect Julia Morgan had created Hearst Castle: 165 rooms and 127 acres of gardens, terraces, pools and walkways—all built to house Hearst’s specifications and to showcase his legendary art collection. Perched atop a hill, overlooking the Pacific Ocean and San Simeon’s rugged coastline, Hearst Castle is perfect for groups large or small ($23pp). After a little rest, your groups will have time for lunch on-their-own, along the Embarcadero. Your group will also get a chance to explore, shop, taste some amazing California wines and/or sightsee ($10-$15pp). The Morro Bay Tourism Bureau can set your groups up with a voucher to include one of the following: wine tasting, beer tasting, boat tours or kayak rentals. End the night with a delectable meal at Windows on the Water—a local favorite ($30-$40pp). *Please note: we can arrange for some wine tasting in the Paso Robles wine country region in route to San Francisco ($10-$20pp).